Oak wilt is a disease of vascular tissues caused by the fungus Ceratocystis fagacearum (Bretz) Hunt. The disease develops in the sapwood, which is the outer layer of wood in a tree. An infected tree produces tyloses and gums that eventually fill the vascular tissues, restricting the flow of water and nutrients (sap). The causal fungus is especially virulent in red oaks and usually kills them. It spreads from infected trees to healthy trees in two ways: through contact between roots in the soil and through the dispersal of fungal spores by vector insects that feed on sapwood. The following insects are able to transport the pathogenic fungus: Agrilus bilineatus, Arrhenodes minutus, Carpophilus sayi, Colopterus maculatus, Colopterus niger, Colopterus semitectus, Colopterus truncatus, Cryptarcha concinna, Epuraea corticina, Glischrochilus fasciatus, Glischrochilus quadrisignatus, Glischrochilus sanguinolentus, Pseudopityophthorus minutissimus and Pseudopityophthorus pruinosus. Root contact is a common route of transmission, allowing the disease to spread quickly: entire stands can become infected in very little time. Browning and wilting of the leaves are primary symptoms that usually appear in May and persist throughout the growing season. Browning starts at the tip of the leaves and progresses towards the base, although some areas may stay green, especially near the midrib. Before long, the whole crown exhibits wilting. The xylem vessels in the wood take on a dark coloration. Fungal mats form under the bark, sometimes becoming so pervasive that the bark lifts up and splits. 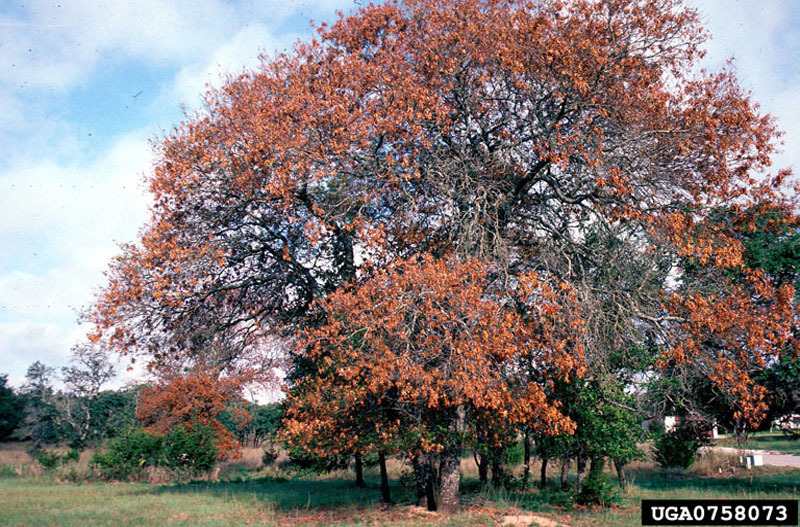 First observed around 1940, this disease is considered by some to be the most damaging for oaks. 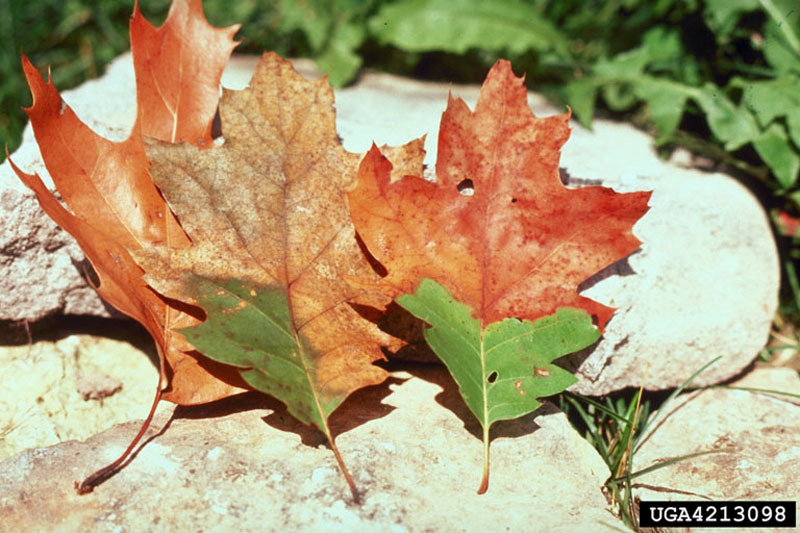 Red oaks usually die within the season during which they become infected. White oaks are more resistant, but most end up succumbing. Inoculation tests have shown that about 50 varieties of oak and many other deciduous species are vulnerable to oak wilt. Trade in wood products, particularly debarked logs (which can harbour bark beetles), contributes to the spread of this disease. Southern Ontario is considered to be at risk owing to its proximity to U.S. states in which the disease is widespread. Some authors have estimated that between 76,000 and 266,000 oaks could be lost in 10 years in only one county in Minnesota. According to these authors, the costs of infection foci removal would vary between $18 and 60 million. However, the benefits generated by these removals (landscape and property value protection, lower emergency removal costs) would largely overcome the management costs. Agence canadienne d’inspection des aliments. Plant Health Risk Assessment Unit. 2007. Ceratocystis fagacearum (Bretz) Hunt – Flétrissement du chêne. Feuillet d’information, Agence canadienne d’inspection des aliments. http://www.inspection.gc.ca/francais/plaveg/pestrava/cerfag/tech/cerfagf.shtml. Consulté en 2007 et 2010. Apetorgbor, M.M. ; Darkwa, N.A. ; Opuni-Frimpong , E.; Agyeman, V.K. 2004. Biodeteriorating agents associated with three tropical timber species. For. Ecol. Manag. 195:311-323. Appel, D.N. 2001. 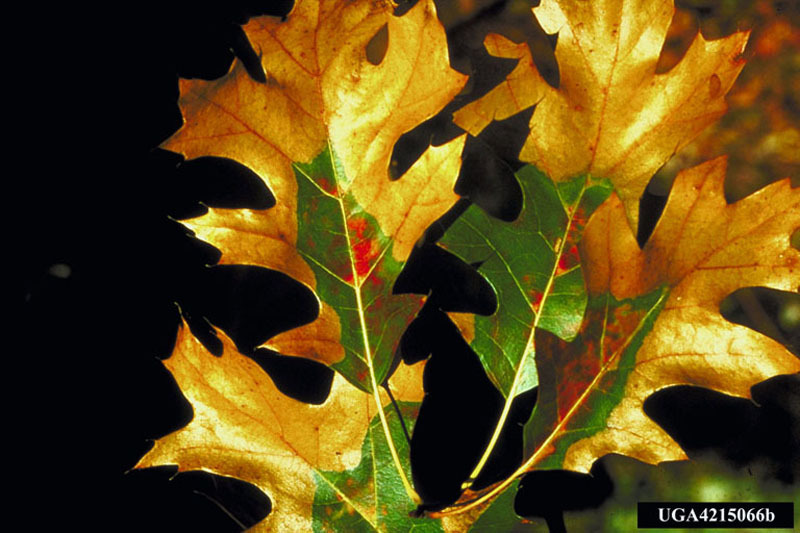 The basics of oak wilt biology and factors influencing disease incidence and severity. In: Ash, C.L., ed. Shade tree wilt diseases. Proceedings from Wilt Diseases of Shade Trees: a National Conference, St. Paul, Minnesota, USA, 25-28 August 1999. APS Press, St. Paul, Minnesota, pp. 71-81. Appel, D.N. ; Kurdyla, T.; Lewis, R., Jr. 1990. Nitidulids as vectors of the oak wilt fungus and other Ceratocystis spp. in Texas. Eur. J. For. Pathol. 20:412-417. Canadian Food Inspection Agency. 2007. 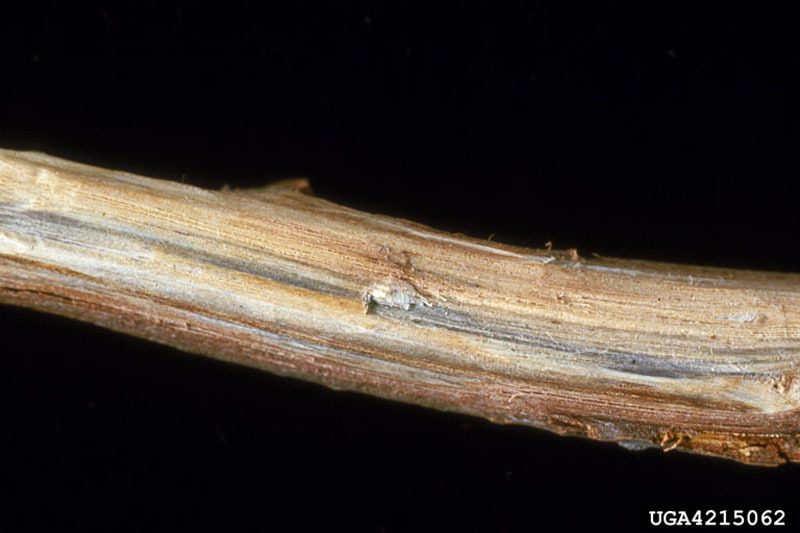 Ceratocystis fagacearum (Bretz) Hunt – Oak Wilt. Fact Sheet, Plant Health Risk Assessment Unit, Canadian Food Inspection Agency. www.inspection.gc.ca/english/plaveg/pestrava/cerfag/tech/cerfage.shtml. Accessed in 2007 and 2010. Canadian Food Inspection Agency. 2001. Summary of Plant Quarantine Pest and Disease Situations in Canada. Haight, R.G. ; Homans, F.R. ; Horie, T.; Mehta, S.V. ; Smith, D.J. ; Venette, R.C. 2011. Assessing the cost of an invasive forest pathogen: a case study with oak wilt. Environ. Manag. 47:506-517. Haring, P.; Crisan, A.; Harsian, I. 1982. Wilt disease of sessile oak (Quercus petraea Lieb.) caused by Ceratocystis fagacearum (Bretz.) Hunt. / Aspecte privind uscarea gorunului (Quercus petraea Lieb.) cauzata de ciuperca Ceratocystis fagacearum (Bretz.) Hunt. Contributii Botanice 77-85. Hayslett, M.; Juzwik, J.; Moltzan, B. 2008. Three Colopterus beetle species carry the oak wilt fungus to fresh wounds on red oak in Missouri. Plant Dis. 92:270-275. Jensen-Tracy, S.; Kenaley, S.; Hudler, G.; Harrington, T.; Logue, C. 2009. First report of the oak wilt fungus, Ceratocystis fagacearum, in New York State. Plant Dis. 93:428. Juzwik, J. 2001. Overland transmission of Ceratocystis fagacearum: extending our understanding. In: Ash, C.L., ed. Shade tree wilt diseases. 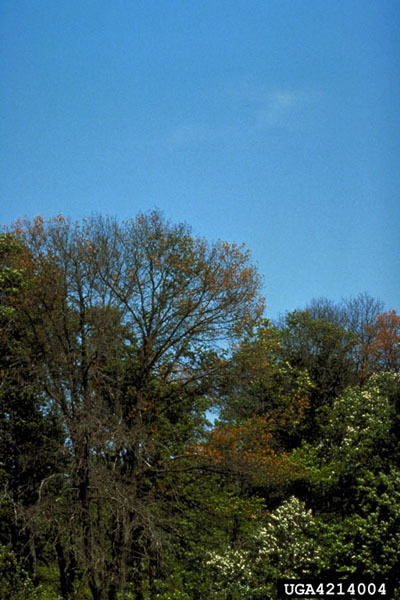 Proceedings from Wilt Diseases of Shade Trees: a National Conference, St. Paul, Minnesota, USA, 25-28 August 1999. APS Press, St. Paul, Minnesota, pp. 83-92. Juzwik, J.; Skalbeck, T.C. ; Neuman, M.F. 2004. Sap beetle species (Coleoptera: Nitidulidae) visiting fresh wounds on healthy oaks during spring in Minnesota. For. Sci. 50:757-764. MacDonald, W.L. ; Pinon, J.; Tainter, F.H. ; Double, M.L. 2001. European oaks - susceptible to oak wilt? In: Ash, C.L., ed. Shade tree wilt diseases. Proceedings from Wilt Diseases of Shade Trees: a National Conference, St. Paul, Minnesota, USA, 25-28 August 1999. APS Press, St. Paul, Minnesota, pp. 131-137. Rosnev, B.; Zlatanov, S. 1982. Vascular mycosis disease of Quercus petraea in the eastern Stara Planina mountains. Gorsko Stopanstvo 38:50-54. Thomas, M.C. 1996. The primitive weevils of Florida (Coleoptera: Brentidae: Brentinae). Entomology Circular (Gainesville) 375, Department of Agriculture and Consumer Services, Division of Plant Industry, Gainesville, Florida, 3 pp. Root grafts on Texas live oak. 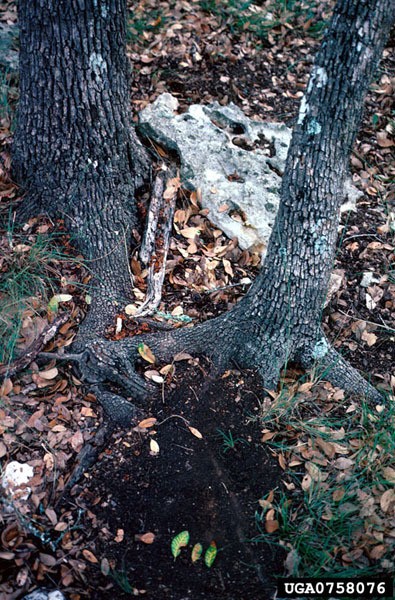 These are the main means by which oak wilt spreads.